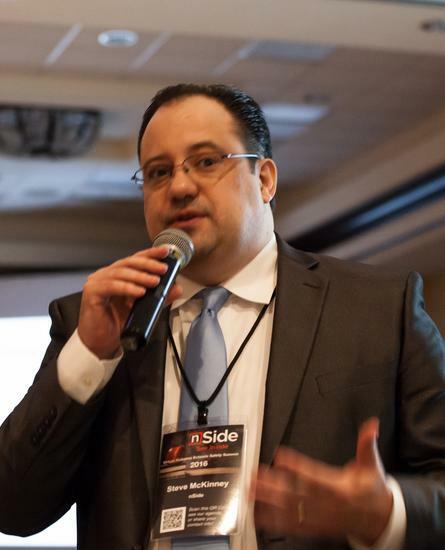 Steve McKinney, Ph.D. is the Founder and CEO of nSide, Inc. Dr. McKinney has spent the last 20 years working in engineering, programming, GIS, emergency management, public safety, homeland security, and most importantly, school safety. During this time he has developed and implemented many systems in law enforcement, public safety, school safety, health and human services, stormwater management, environmental planning and modeling systems, and various other engineering and information technology projects. He is a devoted husband, father, son, and brother, but always pursues his love of entrepreneurship, science, engineering, and technology. Dr. McKinney currently resides in Florence, Alabama with his wife, son, and daughter. Dr. McKinney received a Bachelor of Science degree in environmental geographic information science in 1997 and a Master of Science degree in environmental management in 1999 from Samford University. He completed his Doctorate in environmental health engineering at the University of Alabama, Birmingham in 2009. In addition, McKinney has had extensive professional training in computer languages and technical programs. In addition to Dr. McKinney’s many pursuits, he was listed as one of Birmingham’s “Top 40 Under 40” business people in 2005. He was awarded by ESRI “Vision in GIS” award in 2008 and the “Special Achievement in GIS” award in 2009 and 2010. Most recently he was featured in CIO Review Magazine as a recipient of the “Top 50 Most Promising Google Technology Solution Providers for 2015”. Taught graduate courses in "GIS & Environmental Management Issues" and undergraduate courses in "Remote Sensing" and "Applied GIS"
Introducing students to the basics of Geographic Information Systems. Providing an overview of relevant theory, software, hardware, databases, and applications. Examining trends in GIS technology from the managerial perspective. Storm Water Management Authority, Inc. Determination and management of 2.5+ million dollar budget. Oversight of all departments including Engineering, Administrative & Financial Services, and Information Technology. Responsible for interpretation of Municipal Phase I NPDES permit. Responsible for implementation of Municipal Phase I NPDES permit programs to ensure compliance for 25 cities and Jefferson County. Responsible for writing, reviewing, and presenting technical presentations and reports to political official, business executives, interest groups, and the scientific community. Responsible for all grant writing and serving as Principal Investigator or Senior Scientist on all awarded grants. Conceptualization, design, and development of GIS databases and structures. Conceptualization, design, and development of GIS interfaces and customized programs. Managing hardware and software resources of GIS. Assisting in coordinating contracts with GIS hardware, software, and data cabling. Installing and testing of hardware, software and data cabling. Managing local area network, basic operation and maintenance of the Authority's computer systems. Writing and presenting technical division progress reports to the Authority's Executive Committee. Designed and generated maps for analysis. Met with clients regularly to discuss needs in GIS design. Trained Lucas Engineers and client personnel in the use of customized and standard GIS structures and applications. Maintained Windows NT local area network for approximately 20 users. Purchased, installed and supported all new hardware and software. McKinney, S. State of Forest in the Cities of Jefferson County. 2003 Storm Water Management Authority, Inc.
*Owens, J., Marion, K., Angus, R., Lalor, M., Meyer, E., and McKinney, S. Characterizing a Watershed Sediment Erosion Potential using GIS Technology. 2002 Annual Meeting of the Alabama Academy of Science. *Owens, J., Angus, R., Lalor, M., Meyer, E., McKinney, S., and Marion, K. "An evaluation of sediment-sensitive biotic metrics as biomonitoring tools in the implementation of a watershed Total Maximum Daily Load (TMDL)." Manuscript.